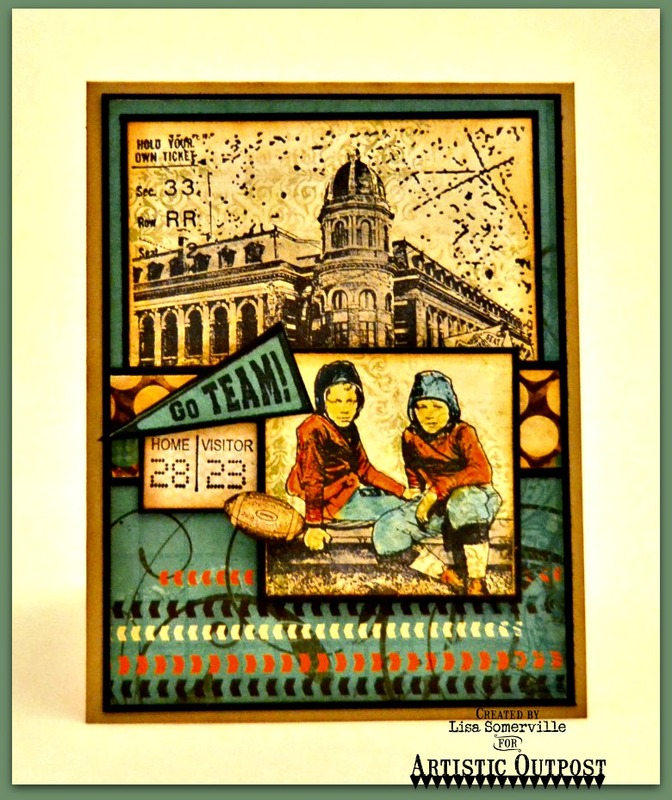 Designs by Lisa Somerville: Go Team! Are you ready to rumble! Today, for the monthly Artistic Outpost Blog Hop, the Design Team is sharing projects created with the stamp sets from the October Release. I'm always in need of masculine cards, so I decided to focus on the Go Team stamp set! Before I share the details of my card, I wanted to remind you that you can now also purchase your Artistic Outpost stamp sets from Our Daily Bread Designs website. All ODBD stamp/die companies have been added to the ODBD Website to save you on shipping! If you missed the email that was sent out earlier this week, you can receive FREE US Shipping on all purchases placed on Our Daily Bread Designs website! International orders received $6.00 off in place of Free Shipping. CLICK HERE for more details, but HURRY, Free Shipping ends TODAY, October 28, 2015! Utilizing some of the MANY scraps of pattern paper I have, I stamped all images on scraps from the same paper collection. Once the images were stamped, I added color using STAEDTLER Karat Watercolor pencils, then sponged the edges with Gathered Twigs Distress Ink. Yes I am and I love the way you used the "Go Team" to create the perfect male card! The use of patterned paper for the stamped images is fabulous! Love this!